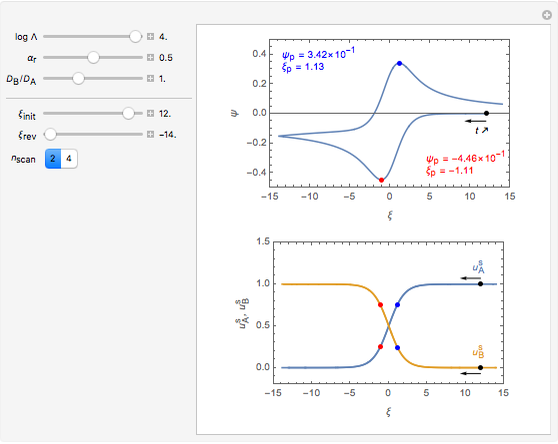 This Demonstration shows a numerical simulation of the cyclic-voltammetric response for a one-step redox reaction ( ) involving two soluble species. Mass transport of both species is characterized as 1D semi-infinite diffusion from or toward a planar electrode in a quiescent electrolyte. Cyclic voltammogram and interfacial concentration versus potential curves are plotted. 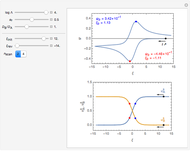 You can experiment with the effects of electron transfer kinetics, mass transport, and potential scan rate using the controls for the dimensionless parameters. You can also explore the dependence on initial and reversal potentials, and . This Demonstration models the Faradaic response for a one-step redox reaction ( ) to a typical cyclic-voltammetry (CV) input signal. The reaction involves two soluble species, and , on a planar electrode (e.g., Pt electrode) in a quiescent electrolyte. Dimensionless notation is used for the sake of generality. The relevant notation is , , , , and , where denotes the standard rate constant (cm/s) for electron transfer at the electrolyte/electrode interface, , all symbols having their usual meaning, is the symmetry factor for electron transfer in the reduction direction (here forward direction), is the potential scan rate in V/s, is the diffusion coefficient for species in /s, is the distance from the electrode surface in cm, is the time variable in s, is the Faradaic current density in A/ , is the controlled potential (with linear variation with respect to time), and is the formal potential of redox couple, both potentials being given in V versus the reference electrode. Setting , for example, the dimensionless input signal is with , where and are the dimensionless initial and reversal potentials, respectively. The initial potential is taken as the equilibrium potential of the electrode pertaining to the bulk concentrations and such as in , so the initial and bulk concentrations for species and are equal to and , respectively. The numerical solution of the 1D linear diffusion equations, together with the boundary condition (relative to electrochemical kinetics) at the electrolyte/electrode interface and the bulk conditions (constant concentrations with respect to time), is readily obtained using the so-called method of lines implemented in Mathematica's built-in function NDSolve. 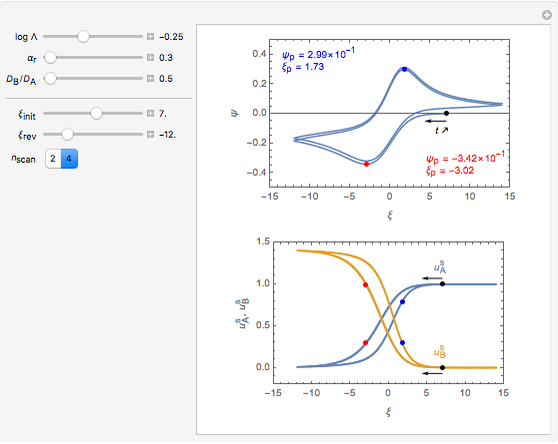 The dimensionless current density is computed versus time from the dimensionless flux of electroactive species at the interface. 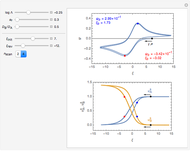 You can vary the parameters (logarithmic scale) and as well as the diffusion coefficient ratio . You can also vary the dimensionless initial potential and reversal potential within some limits. 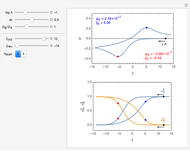 Numerical simulation provides the dimensionless cyclic voltammogram (the parametric curve versus ), together with the dimensionless concentration of redox species, and , as a function of dimensionless space and time variables. The interfacial values ( , with superscript "s"), that satisfy with , are plotted versus . The dimensionless coordinates of CV peaks are evaluated in both the reduction (forward scan) and oxidation (reverse scan) directions, whenever such peaks exist. The two limiting behaviors (relative to the first forward scan only) pertaining respectively to reversible electron-transfer kinetics ( and , observed at large enough values of and , irrespective of ) and totally irreversible kinetics ( and , observed at low enough values of and large enough values of , irrespective of ) can be readily obtained from numerical experimentation. J.-P. Diard, B. Le Gorrec, and C. Montella, Cinétique électrochimique, Paris: Hermann, 1996. J. M. Savéant, Elements of Molecular and Biomolecular Electrochemistry, Hoboken, NJ: Wiley-Interscience, 2006. Claude Montella and Jean-Paul Diard "Cyclic Voltammetry for a Redox Reaction with Diffusion"